Whether you’re a new player or a veteran of many dogfights, The Force Awakens™ Core Set is your entry to the thrilling and intense starfighter battles being fought between the forces of the Resistance and the First Order. If you’re a veteran, you can learn more about The Force Awakens Core Set from the article, “Man Your Ships!” You can also look forward to upcoming articles that will more closely examine the Core Set’s new ships, pilots, and upgrades. 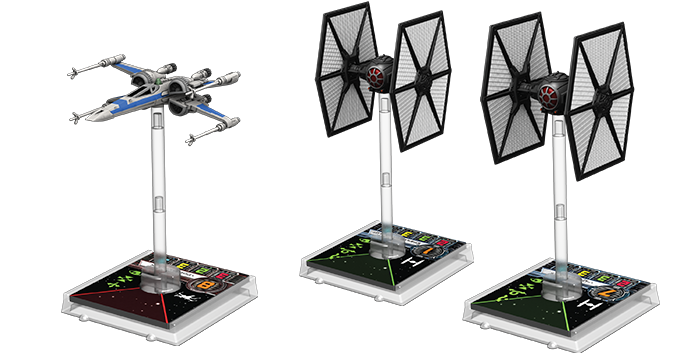 The answer is that X-Wing is a two-player miniatures game of fast-paced starfighter combats set in the Star Wars galaxy. It utilizes meticulously detailed and pre-painted miniature starships sculpted at 1/270 scale and brings those ships and their pilots to life through game rounds that play out quickly, utilizing an intuitive set of rules that take only a few minutes to learn but still provide countless hours of Star Wars space battles. Each round in X-Wing consists of four phases. In the planning phase, you and your opponent secretly choose one maneuver for each of your ships. Different types of ships have different maneuver dials. Each dial reflects a ship’s unique capabilities and features the selection of different maneuvers it can possibly perform. All of these maneuvers are described by their speed and bearing, and each corresponds to a different maneuver template. Additionally, all maneuvers indicate a degree of difficulty. For example, red maneuvers are “difficult,” and if you choose to perform a red maneuver, your ship will receive a stress token after it does so. 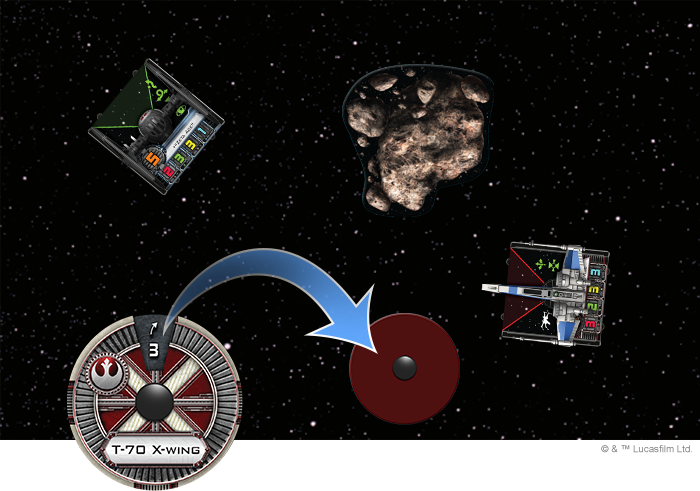 Ships with stress tokens cannot choose to execute red maneuvers but can clear their stress by executing “easy” green maneuvers. To select a maneuver, you rotate your ship’s maneuver dial until the chosen maneuver appears in the dial’s window. Then, you place the dial facedown near the ship. 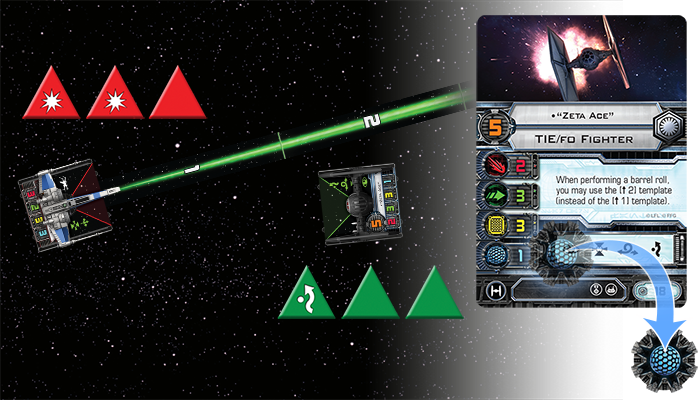 The Resistance player selects a speed “3” right bank maneuver, anticipating that it will allow his X-wing to clear the asteroid and keep his opponent’s First Order TIE fighter within its firing arc. 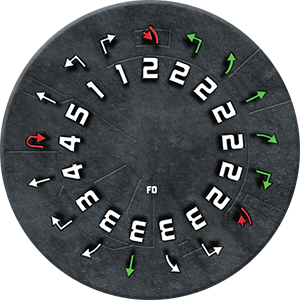 Once you and your opponent have assigned facedown dials to all of your ships, you proceed to the activation phase. In X-Wing, your ships are represented by both the physical miniature that you maneuver about the battlefield and by a ship card, which allows you to keep track of such valuable information as its attack and defense values, its remaining hit points, any unique pilot ability, any upgrades, and its pilot skill value. In the activation phase, you and your opponent reveal your ships’ maneuver dials, execute their maneuvers, and have them perform actions, as they can. You activate ships starting from the ship with the lowest pilot skill value to the ship with the highest pilot skill value. In the case of a tie, the player with the initiative activates any and all of his ships of a given pilot skill value first, and then the player without the initiative activates all of his ships of that pilot skill value. To execute the maneuver you reveal, you take the matching maneuver template and slot one end into the front guides on your ship’s base. Then, holding the maneuver template in place, you lift your ship and move it until you can fit its rear guides to the opposite end of the template. A TIE/fo fighter executes a speed “3” right bank maneuver. Some difficult maneuvers, like the Koiogran-turn, may indicate that you invert your ship. When you perform these maneuvers, after you move your ship, you slot the far end of the maneuver template into its front guides, rather than its rear guides. By performing these difficult maneuvers, your ships may gain powerful tactical advantages, but such maneuvers will also stress your ships! After your ship executes its maneuver, if it doesn’t have any stress tokens, it can perform a single action. Acquire a Target Lock. When you Acquire a Target Lock, you place a blue target lock token next to your ship and the matching red target lock token next to your target. You can then spend your target lock to reroll any number of dice you roll during an attack against the target. Alternatively, many of the game’s most powerful missiles and torpedoes require you to spend a target lock in order to fire them. Barrel Roll. When you perform the Barrel Roll action, you take the speed “1” straight maneuver template and place it alongside the left or right edge of your ship. You then hold the template in place as you lift your ship and place its opposite edge at the other end of the template. You can slide the template and ship back and forth as you perform the action, so long as the template does not extend beyond the edge of your ship’s base. Boost. When you perform the Boost action, you can choose to perform a speed “1” bank, either left or right, or to perform a speed “1” straight maneuver. You cannot Boost if the action would cause your ship to collide with another ship or obstacle. Evade. When you perform the Evade action, you place one Evade token next to your ship. When that ship is attacked and after you roll your defense dice, you may choose to spend your Evade token to generate one free Evade result. Focus. When you perform the Focus action, you place one Focus token next to your ship. Later in the round, whenever that ship attacks or defends, you may choose to spend your Focus token to modify your rolls. If you spend your Focus token to modify your attack dice, you convert all results to results. If you spend your Focus token to modify your defense dice, you convert all results to results. After your ship has completed its maneuver and performed its action, its activation is complete, and you can activate the ship with the next highest pilot skill value. In the Combat Phase, each ship can attack one enemy ship within its range and firing arc. Ships attack from highest pilot skill value to lowest pilot skill value. Again, if there’s a tie for pilot skill value, the player with initiative attacks with all ships of an equal pilot skill value before the other player has the chance to attack. Ships attack and attempt to evade incoming fire by rolling custom red and green attack and defense dice. These eight-sided dice feature a variety of different icons that allow you to quickly determine whether or not your ship successfully hit its target and how much damage it dealt. The game’s red attack dice feature four different results: Hit , Critical Hit , Focus , and blank. Green defense dice feature three different results: Evade , Focus , and blank. 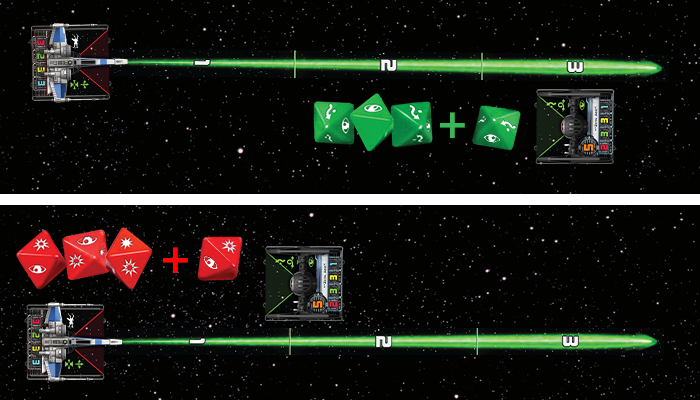 You roll one red die for each point of your ship’s attack value, and your opponent rolls one green die for each point of his ship’s agility value. Each Evade result he rolls cancels one of your Hit or Critical Hit results, with Critical Hit canceled last. Each uncanceled Hit or Critical Hit result deals one point of damage. If your opponent’s ship has any shields, this damage is first applied to the shields. Once a ship has lost its shields, however, each point of damage is applied to its hull. A Resistance X-wing performs an attack against “Zeta Ace” and rolls two hits. “Zeta Ace” manages to evade one of those hits, but the second hit goes uncanceled. 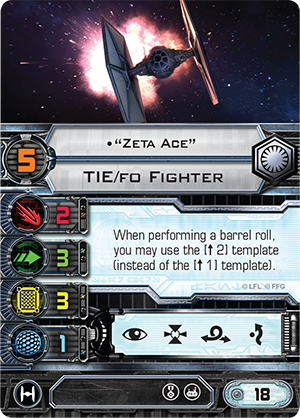 The damage is applied first to shields, so “Zeta Ace” removes a shield token and must now fly without shields. For each point of damage a ship suffers against its hull, one card is drawn from the damage deck and placed next to the matching ship card. Damage cards inflicted as the result of an uncanceled Hit are dealt facedown. Any damage cards a ship receives from an uncanceled Critical Hit are dealt faceup, and these cards’ effects then apply to the ship. After previously punching through his opponent’s shields, the X-wing pilot performs another attack. The Resistance player rolls a hit and critical hit. “Zeta Ace” attempts to dodge the shot, but again only manages to roll one evade. The evade cancels out the hit, but the critical hit is applied to the TIE’s hull. The First Order player draws a faceup damage card, and it’s a Direct Hit. “Zeta Ace” is barely alive, with just one remaining hull point! If a ship receives a number of damage cards equal to its hull value, it is destroyed! Notably, you can gain tremendous advantages in combat by paying close attention to the distances at which you engage your enemies. When you defend against an enemy’s primary weapon at Range “3,” you roll one extra defense die, but when you perform an attack with your primary weapon at Range “1,” you roll an extra attack die. 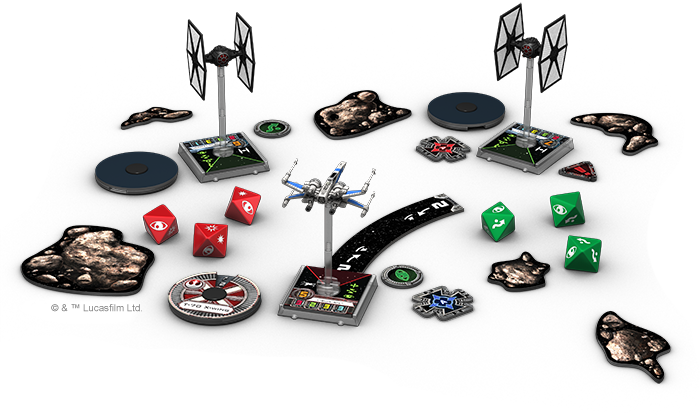 If the X-wing attacks the TIE/fo fighter at Range “3,” the First Order player rolls an extra defense die. On the other hand, if the X-wing performs its attack at Range “1,” the Resistance player gets to roll an extra attack die. After all ships have had a chance to attack, you and your opponent remove all unspent Evade and Focus tokens and move on to the next Planning Phase. Secretly plot your maneuvers, fly at your enemies, take aim, and fire! 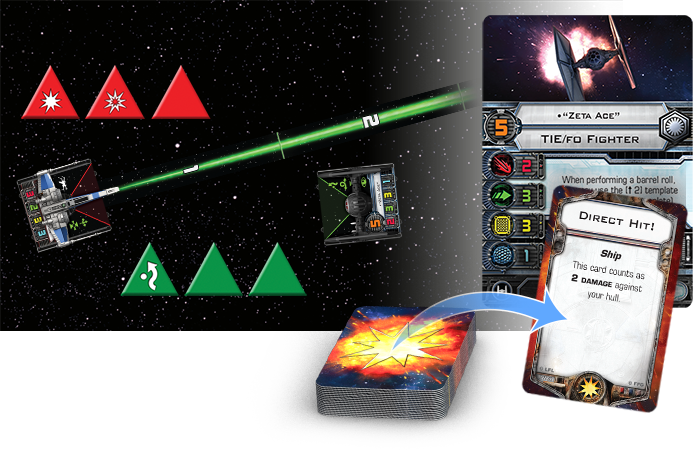 Whether you fly a custom squad in one of the game’s missions or just attempt to eliminate your opponent’s forces, your games of X-Wing always move through the same four phases. And while it takes just minutes to learn the rules, there’s plenty of depth to explore with the tactical selection of maneuvers and actions, as well as the nearly limitless possibilities for squad building. Strap yourself into the cockpit of a T-70 X-wing or a TIE/fo fighter, and go fight for the fate of the galaxy! 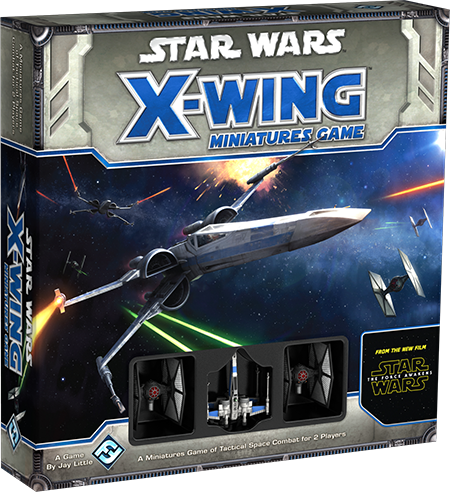 X-Wing is a tactical ship to ship combat game in which players take control of powerful rebel X-wings and nimble Imperial TIE Fighters, facing them against each other in fast-paced space combat. Featuring stunningly detailed and painted miniatures, X-Wing recreates Star Wars’ exciting space battles. Select your crew, plan your maneuvers, and complete your mission!